Football is finally here! To help get you started for the season, we have unveiled our 2nd All-North Louisiana Offensive and Defensive Team. 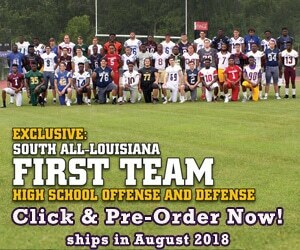 To find out who made the team, click here and to find out who made the 1st All-North Louisiana Offensive and Defensive Team, make sure to buy our 2018 North Magazine edition! 2018 Louisiana Football Magazine North and South Editions Now Available in Stores Near You! August 22, 2018	Comments Off on 2018 Louisiana Football Magazine North and South Editions Now Available in Stores Near You! Our 2018 North and South Louisiana Football Magazine editions are now available to purchase in stores as well as online. Here is everything that you need to know about both magazines and where you can purchase your copy! Check out today's player spotlight on Jena senior QB and Trinity Valley Community College signee Lamar Farris! February 27, 2018	Comments Off on LAFM TV 12th Season! Episode 19! These Louisiana colleges have the resources of some of the best talent in the entire country right here in the Pelican State. Louisiana Football Magazine's recruiting expert Lee Brecheen gives out some of the most underrated local talent for each college that can make the biggest impact on the gridiron for each particular college next Fall!